I believe after this demonstration there is no one in doubt that the fields at the poles are totally separated and joined and controlled only at the dielectric plane aka Bloch region. Dipole magnetism is two monopoles joined together. There is no flux going directly from on pole to the other. I could be wrong but empirical evidence so far suggests the above. Been busy friend...NOW...THAT'S WHAT I MEANT BEFORE!!! Last edited by Ufopolitics; 06-27-2018 at 12:14 PM. Therefore, as i said many times before the field shown by iron filings is a shortcircuit magnetic field falsly taken as the field of a magnet for the last 200 years! There is no force lines (flux) from N-S poles... iron filings is just an interaction imprint and does not show the undistorted field of a magnet which is essentially two toroidal fields back to back. Last edited by Markoul; 06-27-2018 at 04:03 PM. What? Are you kidding me Ufo? It looks like my car headlights in the fog. In other words, a combination of reflection from the shiny surface of the disc magnet and optical distortion from the glass container and two different media. Do exactly the same experiment with unmagnetized disc and you'd see the same light cones. I don't think it's a reflective fog on medium...look after min 3...and notice under just red light...how it shows rings and not cones. Could you ask Mike if he could repeat same test but wrapping whole magnet with matte tape or black cloth? o exactly the same experiment with unmagnetized disc and you'd see the same light cones. You would get the same field image even if the magnet was inside a black wooden or plastic box... has nothing to do with light interference, it is just magnetism shown by the ferroliquid. Mike is watching closely this thread I ensure you although he does not respond directly he answers through his latest videos and experiments. Ken does the same thing responding to the arguments set on these thread here. No need to ask them anything. High sensitivity high contrast and resolution new prototype Ferrocell made by its inventor Timm aka dyetalon. The vivid images this new cell shows are Amazing! 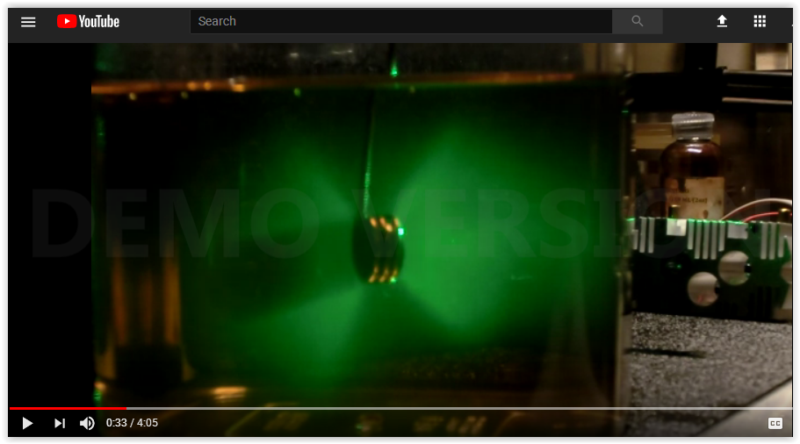 The above thumbnail of the video is a confirmation that inside the bulk body of a magnet there is no magnetic flux flowing (black outer ring). Body of a magnet holds only that what we call, the dielectric field of the magnet thus the poles entrance points (black inner circle) and Bloch domain wall (midlle of magnet) with the rest of the bulk mass material of the magnet. Last edited by Markoul; 06-28-2018 at 08:42 AM. Hello Mike, Excellent video! !...but even better than video is your idea to see field in 3D... thanks to the whole set up. Now, please, we need your help at Energetic Forum>About the Ferrocell>by Timm Vanderelli. Some ppl there (skeptics) are saying that all we are seeing there is the chrome reflection on the viscous medium you have created ...just like headlamps from a car on a foggy night... So, could you please make another video where you first show the magnet (outside container) wrapped by black, matte, electric tape, or any other non reflective material...to demonstrate that it is just pure magnetic field effect and no reflections?...please? Really appreciate all your time on this research and experiments...they are VERY HELPFUL, my friend!! Yea but I need to make a new batch of TFL. The batch in the video was cloudy and silvery, the magnet was reflecting light but there was also a field in there. just got a gallon of grape seed oil and will make a fresh batch tomorrow. Will try an electromagnet. no reflections there﻿. So, we have the light source on right sending its light direction towards the magnet...like I show with green arrow...then, yes, we do have a reflected light on the right side face of magnet, reason why that cone of light is much brighter than the cone in the opposite end...as all this reflection does, is to generate a much better lighted contour illumination of the cone, which we could call a "Higher Definition". If you all notice, the cone on the dark side doesn't have defined (brighter) contour lines (No HD), instead... it is blurred/Blended more smoothly into the medium. Notice that the Penumbra "cylindrical" projection ALWAYS is generated OPPOSITE to the Light Source Direction. And finally, the projected circular shadow (in light blue) shows at the very end of the penumbra projection zone. 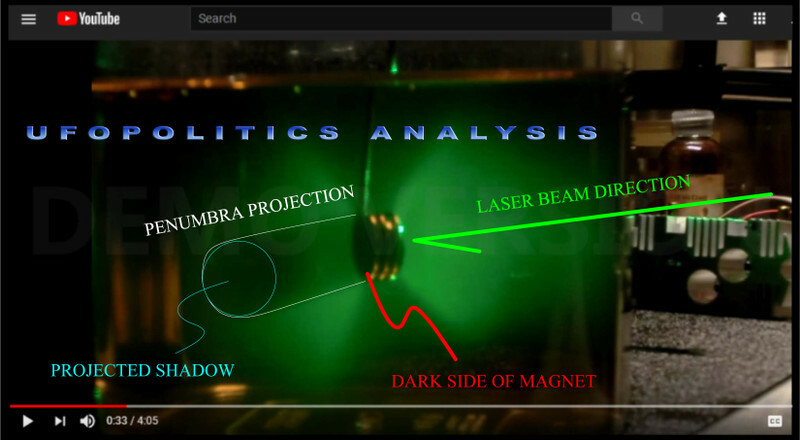 Concluding, that Mike is right...there are both, Field 3D plus Reflection from the shiny surface of magnet into the medium...HOWEVER, please realize that the other side of the magnet is NOT ILLUMINATED from LASER BEAM, hence it does not Emit absolutely NO REFLECTION OF LIGHT!!! Last edited by Ufopolitics; 06-29-2018 at 02:35 AM. Nice analysis but we already know the hourglass shape of the dielectric magnetic field thus the inner surfaces of the two toroidal back to back 3D geometry magnetic field. 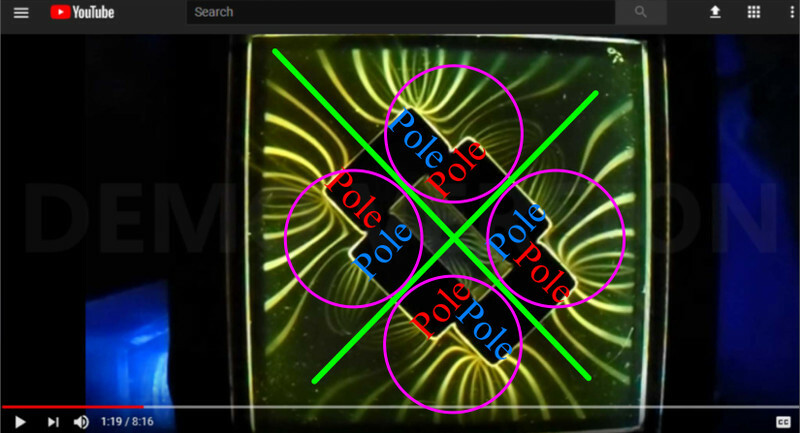 Mike's ferroliquid shows only the inner part of the ejected magnetic field generated on the domain wall through the poles but it does not show the curling of the field lines returning through the poles forming the two torus back to back effect. I think the explanation the large mass of ferroliquid not showing the curling of the flux is liquid pressure inside the container and buoyancy not allowing the ferrofluid to move freely and follow the magnetic flux of the field. Ferroliquid aquarium may definitely produce a 3D projection of the field but it can not show the entire field since it lacks the sensitivity in doing so. Another excellent video from Brian showing the fractal nature of magnetism. Interesting you get the fractal field also inside the hole area of the array. Can't you tell from the ferrocell pattern? The Four Magenta Circles are the attraction areas for both OPPOSITE POLES attracting bonds. Ferrocells can not tell which side is North or South...since they show ALL angled inclined circular curls of force for both poles and not ONLY the predominant spin in the sequence like B&W CRT SCANLINE does. Therefore, Poles letters are denoted in red-blue just to highlight they are opposites...but like I said before...is just for reference and it could be the other way around (reversing color polarities). Last edited by Ufopolitics; 07-01-2018 at 09:53 PM. Thank you for your helpful and enlightening analysis and presentation. However, I announce an official Ferrocell contest to anyone to be able to show us a definitive difference on the North and South pole views using a ferrocell. I mean by comparing the flux lines orientation and skew angles directions (i.e. lean left or right) on the two poles. Tip: Decouple and prevent both pole fields to show up simultaneously on the ferrocell when observing the pole of a magnet placed under the ferrocell due the ferrocell's magnetic transparency. If the skew angles direction are be found to be the same on both poles, that would be a surprise although I can still offer an explanation for the different magnetic behavior in the different poles of a magnet explaining repulsion and attraction mechanism. Last edited by Markoul; 07-02-2018 at 05:03 PM. Yes. There is also dielectric planes between all opposite poles. On the magnet and between the separate magnets at the ends. Every time two opposite poles join... there is a dielectric field born in between...right at the bounding gap...or division(s). If there are only two magnets attached...then each dielectric moves forward towards the connecting division. In this case all dielectric planes exists....-I believe- since it is within a closed, continuous and round loop...meaning that...because magnets are not fully engaged at an axis-direct bound (180°)...but by a 90° degree joint. Last edited by Ufopolitics; 07-02-2018 at 10:14 PM. I am wondering if these crossing dielectric planes (Bloch axes) are actually generating a magnetic pole at the center of the array? I wish you the best for your presentation Ken! Bring a video link here of your presentation. Any chance to have a live video feed? Mike Palazzola did it! First ever complete 3D projection of a dipole magnetic field!! Light sources used in the experiments are single white LED light (green) or laser line projection (pink). The pictures and video I will present you following should stay in this thread here and not go out . Mike is busy with his experiments and asked me to make the presentation of his findings. He responded to the ferrocell contest above and what he did is simple AMAZING AND NOVEL!! What you see here is the true 100% complete 3D Euclidian space projection of a dipole magnetic field. The trick: Because the ring magnet is diametrically magnetized fig.1, this allows both poles of the magnet be magnetically confined and shown inside the hole of the ring magnet. For whom understands what I am talking about knows how important that is! In a nutshell using a diametrically magnetized ring,you catch two birds with one stone!! You get both poles of the magnet magnetically confined inside the inner ring of the magnet so that the field does not expand inside your Transparent ferroliquid (TFL) and the true geometry of the dipole magnetic field is shown by all its glory!! fig.2 Mike's TFL 3D magnetic field imaging experiment. Theta θ, pattern of dipole magnetism. We clearly see the two separated by the Bloch wall axis torus magnetic bubbles up and down, North and South Poles. A single white LED lighting was used. fig.3 Timm's historic photo. The first who found the same theta θ pattern of the outline geometry of the magnetic dipole field is the inventor of the ferrocell himself, Timm aka dyetalon. He took this historic photo back at 2007 with a Ferrocell fitted on a special apparatus he made called fluxscope using a cylindrical magnet and a single light source. The theta θ pattern repeats in overlaying shells 360° around space up to the range of influence of the magnet making up the total magnetic field sphere of the magnet. fig.4 Ufopolitics great dipope magnetism geometry 3D illustration of the two torus shaped magnetic bubbles separated be the Bloch disk domain wall. fig.5 Mikes's Laser line projection 2D slice of the field of the magnet. The theta θ pattern! fig.6 Mike Palazzola's experimental apparatus. -This is a 2 inch ring magnet with each pole covering 180 degrees of the ring. So the north and south poles are at the top and bottom of the ring. I don't think the poles ever meet. -Cloudy TFL backlit by a single white LED. -There is a very narrow viewing angle so unless the light source is on the same plane as the camera the poles don't appear even in size. The vertical laser line shows a solid even theta symbol. when I tilt the line slightly, the theta appears open ended. There are some things which are hard to see but visible none the less. What I can say?!... AMAZING job Mike!! Last edited by Markoul; 07-05-2018 at 08:26 PM. Is a dipole magnet two magnetic monopoles joined? Elaborating further on Mike's amazing experimental data strongly indicating and confirming previously the pioneering experimental findings by Timm and coming to the same end result and conclusion thus 3D geometry of any dipole magnetic field consists of two toroidal shaped fields or bubbles each bubble residing on each pole of the magnet, back to back and separated by the Bloch domain wall region of the magnet. Therefore, the theta θ two hemispheres pattern outline geometry of dipole magnetism was confirmed by two different researchers and two different experimental methods applied. Therefore, the two hemispheres geometry of magnetism must be regarded as proven, I submit. ...so it seems to me, my opinion...that dipole magnetism, essentially consists from two joined magnetic monopoles... hold together and at the same time separated by the dielectric plane or else called Bloch domain wall of the magnet. I've been busy doing other stuff for a while & just caught up to you guys. Very good experiment for sure! You're a genius Mike. These results do seem to correlate with my early experiment. Now all we need is a 3rd verification using plasma. It should present the same views. Gotta go. Good luck in Utah, Ken. Have fun. 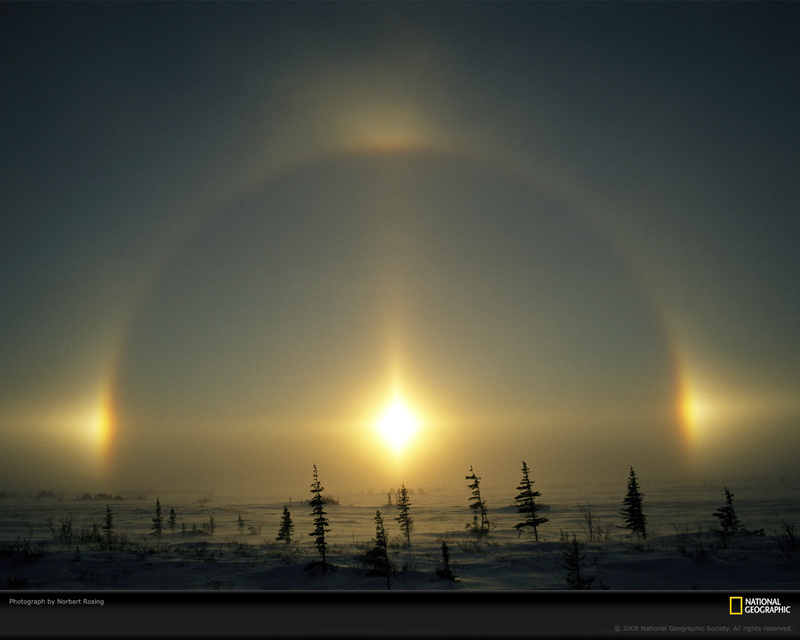 Ferrocell as shown in the image discovered by Timm, the sundog, and now what Mike is showing, they all point to the very same thing. Intermediate pressure return to zero-point/point of symmetry (supersymmetry) is missing in our magnetic field understanding. Last edited by Selfsimilarity; 07-06-2018 at 04:33 PM. Thank you for your input and confirmation. Any serious researcher on this matter will appreciate what Mike is showing us here. This is a historic video any academic or independent researcher should feel astonished and amazed by viewing this video evidence. Ingenious experimental setup and novel observation. This is the first ever true 3D projection of the true geometry of magnetic dipole field consisting by two separated hemispheres joined at the middle. Each hemisphere bubble is one pole of the magnet. Dividing line at the middle of the field is the Bloch domain wall of any magnet. Last edited by Markoul; 07-06-2018 at 07:58 PM. Thanks I appreciate the hard work and sharing this information about the effects of magnetism on paramagnetic media. agree why not include these paramagnetic effects as part of the curriculum. ...it's not paramagnetic media but superparamagnetic which means the magnetic moment of the ferrolens thin film is many times stronger than paramagnetism and really more like ferromagnetism in strength when an external magnetic field is applied. However magnetic anisotropy of superparamagnetic ferrolens Fe3O4 magnetite encapsulated thin film under an external magnetic filed is much much less than this of the strong ferromagnetic iron filings making the ferrolens almost magnetic isotropic. Therefore, nanoparticles chains (Fe3O4 superparamagnetic needles) in contrast with the strongly anisotropic iron filings with keff=480x10^3 erg/cm^3 !! @ room temperature 300 Kelvin, can follow and align with any potential magnetic flux on a magnetic dipole field and not only to the strongest potentials in the field i.e. poles of magnet as iron filings (i.e. ferromagnetic needles) do. 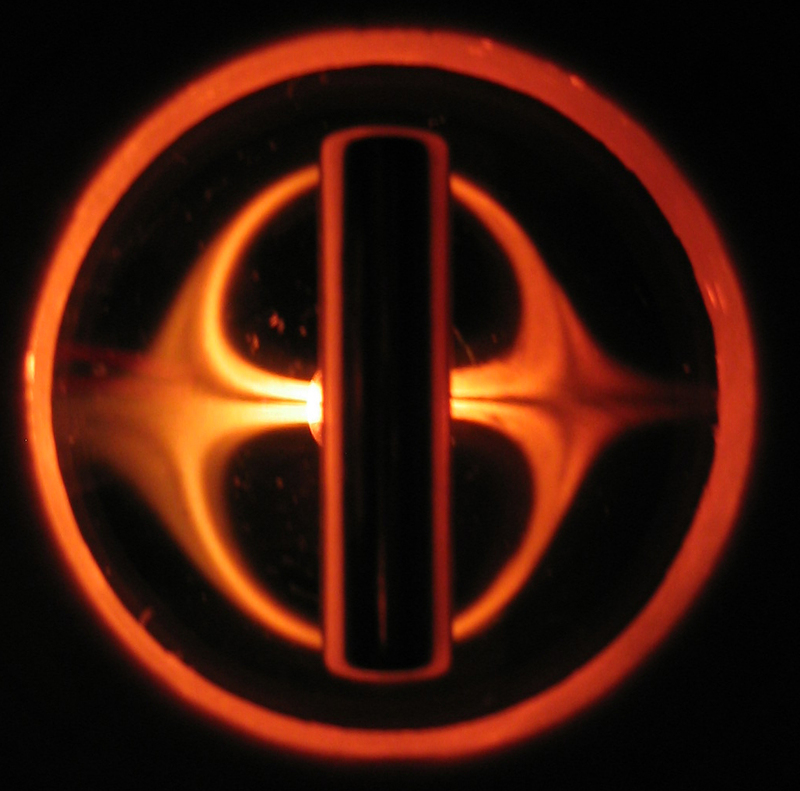 The pattern Mike Palazzola shows in his experiments of the dipole field of a magnet is real and is the Universal field of any dipole ferromagnetic, permanent magnet or electromagnet. Last edited by Markoul; 07-08-2018 at 12:43 PM. 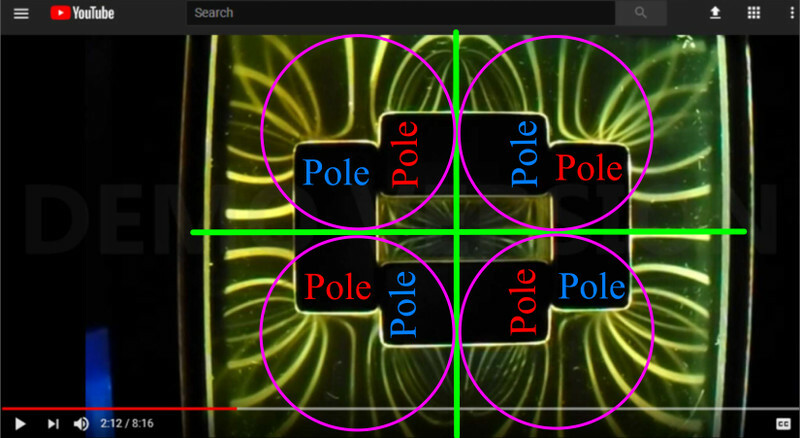 Pole flux pattern as shown later on the above video is the same on both poles N-S of any dipole magnet. No difference on the wire-frame flux pattern. So, WHY THEN SAME POLES OF TWO MAGNETS REPEL AND OPPOSITE ATTRACT?? Any ideas and explanations you may have?